In the last post I mentioned a possible use for completed family reconstitutions viz. 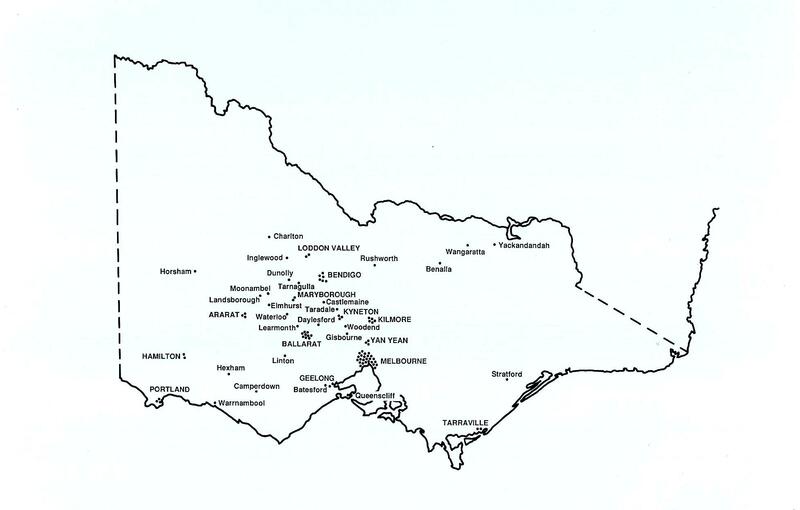 maps showing the location of the orphans at particular times in their lives. 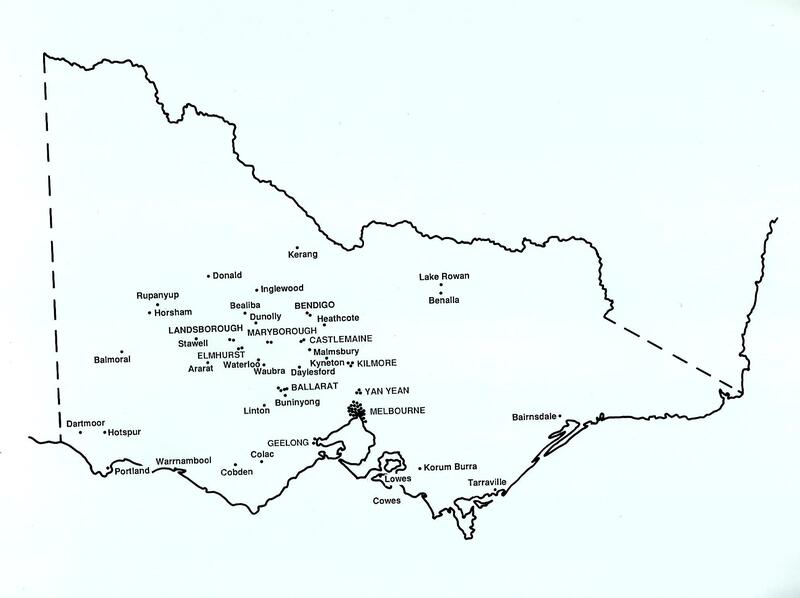 Here’s a couple I used in Barefoot 2–the location of the orphans in Victoria in c.1861. This one is based on the birth records of their children. The second one is the location of the orphans in Victoria at the end of their lives c.1890-1901; this one is based on their death certificates. Mike Murphy used some of these maps in that magnificent volume, Atlas of the Great Irish Famine, p. 554. A couple relating to Queensland in particular also appeared in Irish Women in Colonial Australia, pp.112-3. Obviously the more information is gathered about the orphans the more these maps will need redrawing. Nor do you have to stick with the dates I’ve chosen. Anyways, for your perusal…perhaps you can see the influence of the Victorian gold rushes? As you can see, family reconstitutions have more than one use. Maybe you can think of others? This entry was tagged Australia c.1891-1901, Famine orphans in Victoria, Famine orphans in Victoria c.1861, Great Irish Famine, Irish Famine orphans, Irish Famine orphans to Australia, Irish Famine orphans' settlement in Victoria, Irish female emigration. Bookmark the permalink. Thanks Trevor. Yes, the Lady Kennaway is confusing. I mention on the website about the problems with different records giving different native places – one of the reasons why my list of names is made up of 29 girls but actually only 25 girls went from Ballina on that ship. I have nine names with conflicting origins – Bridget Benson, Mary Fox, Jane Gardiner, Honor Gormally, Catherine McDermott, Winifred Nelis, Mary O’Hara, Biddy Quin, and Margaret Roach. I really only scratched the surface with what I could get done during the dissertation (I had five other subjects as well), so I’ve still got a lot of work to do. Coincidently I did actually email Tinteán last week via a contact email on the website (Liz McKenzie) after the last newsletter came out, to let them know about the website. I’m really looking forward to making links with descendants – because of time constraints most of my research so far has been finding them in the records, not yet taking it to descendant level. And yes, Clew Bay is a beautiful part of the world, and we live in an even more beautiful (hidden) part of that. I think the tourists are starting to find us though! Not so beautiful today though, it’s blowing a gale and lashing rain. Perfect weather for studying, when I’m not getting distracted! Right in the middle of final exams now. Thanks very much Trevor. Out of courtesy I posted the message to you above before I put the notification about my website on Twitter and Facebook, but I’m glad you picked it up there anyway. I got good feedback on both my dissertation and my website in my interview with the internal examiners, hopefully they’ll pass on both to the external examiner. I’ve referenced you throughout the whole dissertation and the website so I don’t think they could possibly miss it! I just did two basic maps for my dissertation, based on the data I could gather about the Mayo girls. I put them on the website here: http://mayoorphangirls.weebly.com/the-mayo-girls.html. Unfortunately on the website there are a few dots without names in NSW (Parramatta, Penrith, Liverpool and Raymond Terrace) – they didn’t come out on the website image, I’ll have to re-look at it after my final exams are over. Thanks so much again for your lovely comments, I really appreciate it. Great to hear you’re doing so well Barbara–well deserved. Are your exams coming up? I remember years ago when looking at some of the Melbourne shipping lists being confused. There was more than one shipping list and more than one disposal list. You’d find Mary Fox per Lady Kennaway being listed as from Mayo in one and Town of Donegal on the other or Bridget Gillespie being listed as from Sligo on one and Mayo on the other. A bit tricky–no? Many thanks for the link to your website. I’ll be looking closer soon. it looks brilliant from what I’ve seen. You might like to send the link to Frances or Felicity at Tintean. That might bring more descendants to your attention.(? )I had a lovely stay at Clew Bay some years ago. Tis a beautiful part of the world. I’ve only put up information on how the scheme was administered in Co Mayo, but only handful of individual girls’ stories so far. I’m heading into final exams this week so I’ll return back to the website once they’re over to continue adding more individual stories etc. I’m a mature student at GMIT Mayo Campus (and an Aussie living in Mayo), and I recently submitted my 4th year dissertation on the 137 Mayo orphan girls. I created two maps as part of the dissertation using GIS mapping, the first showing Native place (where given), which for the Mayo girls was either a townland, a parish, or the workhouse of origin, and the second showing the place of first employment (where known). For the Mayo girls it revealed clearly that aside from Sydney and Melbourne, a significant number were found around Wollongong and Kiama – begging the question of how many people in these areas today can trace themselves back to a Mayo girl. Creating the maps is certainly a valuable way of looking at the information gathered from a different perspective. I have to create a website as a requirement of my course and will be doing this on the Mayo girls as a way to disseminate my results – I’ll certainly send you a link to it when it is completed. That’s brilliant Barbara. I look forward to the link.